The ultimate room for those seeking serenity. Disconnect from it all in our charming Fanny Wallow Room in the Pond House. 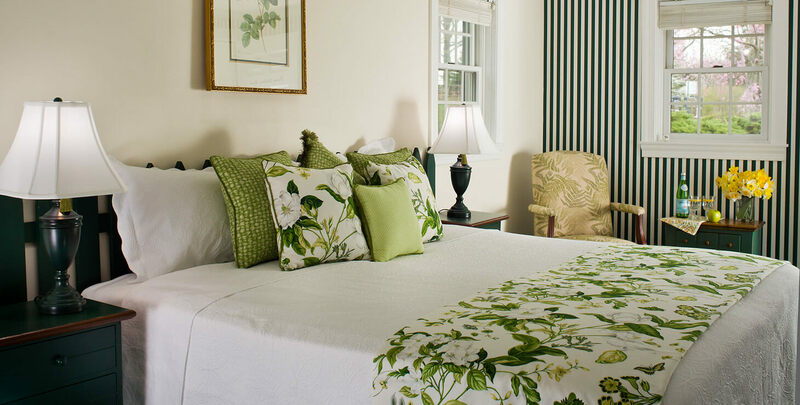 Our commitment to your relaxation continues with king-sized bed (or 2 twins) dressed with hand-made pillows and bedding ensembles styled with elegant, Hunt Country design finished with crisp white linens. The Fanny Wallow has an en suite private bathroom with marble floors, plush towels, and shower. Relax in the privacy of your room or out on your patio while taking in the panoramic view of the pond and relaxing sounds of the fountain and cascading waterfalls. The Fanny Wallow Room is the perfect place to enjoy a glass of wine and escape the hustle and bustle so you can reconnect with yourself, your loved one and nature.